Bread is softened with water and mixed with yogurt and potato mixture. It is then bonded with besan / gram flour and made into small disks. The bread potato vada are then deep fried in oil till golden brown in color. Serve bread potato vada immediately as a tea time snack with ketchup. 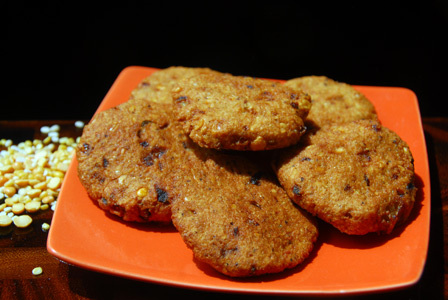 Makes: around 8 Bread Potato Vada. Wash, halve the potato and boil in water till cooked and soft. Peel the boiled potato and crumble it. Remove the crusts of the bread and tear the bread. Soak the bread in little water for few minutes to soften it up. Squeeze the water out of the bread. In a mixing bowl, mix together squeezed bread, yogurt, besan, crumbled potato, onion, green chiles, cumin seeds and salt. Adjust seasonings if necessary and take a big spoonful of above mixture and form into soft ball and press the ball between palms to form a disk. Repeat the same with remaining bread potato vada mixture. Heat oil in a deep fying pan on medium low heat. Carefully drop the prepared bread potato vada into hot oil. Repeat the same until surface of the oil is filled up. Fry the bread potato vada on both sides till golden brown in color. Once fried, remove the bread potato vada onto absorbent paper. Repeat the same with any remaining bread potato vada mixture. Serve bread potato vada immediately as a tea time snack with ketchup. Notes: Make sure to adjust the temperature where necessary to fry the bread potato vada evenly. Suggestions: If the bread potato vada is soft inside, put them back into hot oil and deep fried again till crisp outside and cooked inside. If its hard, make sure the mixture is not too tight, adjust with yogurt. Variations: You can also add coriander leaves or mint leaves to the bread potato vada mixture before deep frying. Other Names: Bread Potato Vada. Three different dals are soaked in water and ground into coarse paste and mixed with freshly ground spices and onion. The small amount of mixture is flattened on the palm and then left in hot oil and fried till golden brown in color. Serve mixed dal vada immediately as a tea time snack. Makes: around 8 Mixed Dal Vada. Soak chana dal, urad dal, moong dal, rice in enough water for around 4 – 6 hours. Peel and roughly chop the ginger. Grind the coriander seeds, cloves, cardamom, cinnamon into fine powder using spice grinder. Grind the soaked dals, ginger, salt into coarse paste using a blender. Add least amount of water only if necessary while grinding the dals. In a mixing bowl, mix together chopped green chiles, chopped onion, ground spice powder, mixed dals coarse paste and salt (if necessary). Take a lemon sized portion of the mixed dal mixture and form into small ball. Flatten the ball on the palm of your left hand and slowly drop into hot oil. Fry the mixed dal vada on both sides till golden brown in color. Once fried, remove the mixed dal vada onto absorbent paper. Repeat the same with any remaining mixed dal mixture. 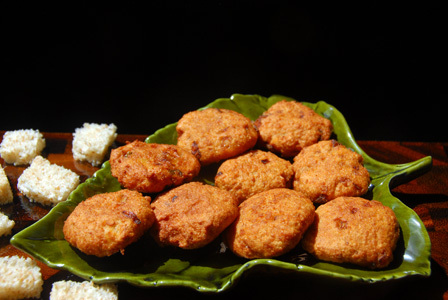 Serve mixed dal vada immediately as a tea time snack. Notes: Make sure to adjust the temperature where necessary to fry the dal vada evenly. Suggestions: If the dal vada is soft inside, put them back into hot oil and deep fried again till crisp outside and cooked inside. Variations: You can also add coriander leaves or mint leaves to the dal vada mixture before deep frying. Other Names: Mixed Dal Vada, Pappula vada. .
Cauliflower is either grated or finely chopped. It the then mixed with gram flour and made into thick paste. Spoonful of mixture is dropped into hot oil and fried till golden brown in color. Serve grated cauliflower fritters immediately. Makes: around 4 Servings of Grated Cauliflower Fritters. Discard leaves, wash and either finely chop or grate the cauliflower. Peel and finely chop the onion and ginger. In a mixing bowl, mix together cauliflower, onion, ginger, green chiles, besan, rice flour and salt. Add few splashes of water and make into somewhat thick wet mixture. When oil gets hot, scoop a tablespoon of the cauliflower mixture and drop into hot oil. Repeat the same till the surface of the pan is filled. 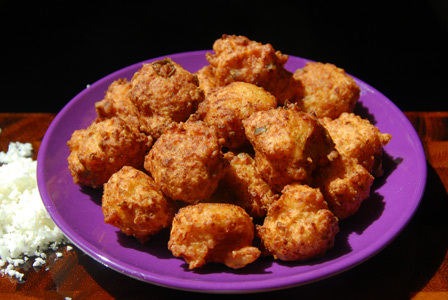 Fry the grated cauliflower fritters on both sides till golden brown in color (around 3 – 5 minutes). Once fried, remove the grated cauliflower fritters onto absorbent paper. Repeat the same with any remaining cauliflower mixture. Serve grated cauliflower fritters immediately. Notes: Make sure oil is not too hot at any point of time. Suggestions: Adjust with besan if the mixture is too wet. 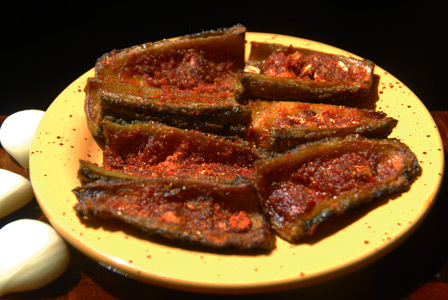 Adjust spice with green chiles or add a pinch of red chili powder. Variations: You can also add chopped cilantro to the cauliflower mixture if you wish. Other Names: Grated Cauliflower Fritters. Black eyed peas and soaked in water for few hours and ground into smooth paste with spices and yogurt. 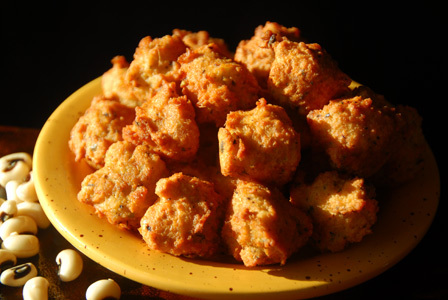 It is then mixed with flour to thicken a bit and deep fried till fritters are golden brown in color on all sides. Serve black eyed peas mixture immediately with tomato sesame chutney or any chutney of your choice. Soak black eyed peas in water for around 3- 4 hours. Refresh in water and strain the soaked black eyed peas. In a grinder, add the black eyed peas, ginger, green chiles, cumin powder, yogurt and salt. Grind the above mixture into smooth paste without adding any water. Remove the ground black eyed peas mixture onto a mixing bowl. Add rice flour, besan to the mixing bowl and mix well. Scoop a tbsp of black eyed peas mixture and carefully drop in hot oil. Deep fry the black eyed peas fritters till golden brown in color on all sides. Once crisp, remove the fritters onto absorbent paper. Repeat the same with any remaining black eyed peas mixture. Serve black eyed peas mixture immediately with tomato sesame chutney or any chutney of your choice. Notes: Make sure not to add too much yogurt or any water to the black eyed peas while grinding. Suggestions: If the black eyed peas mixture is little runny, add rice flour to thicken the mixture. Variations: You can also add whole cumin seeds after the mixture is ground into paste by skipping cumin powder. Other Names: Black Eyed Peas Fritters, Bobbarlu Punukulu.